Hi there. I have enjoyed reading your commentaries for a while now, and now I see that you have seen some of my work – the map of Clare County you used from “Michigan Railroad Lines” by Graydon Meints is one of mine. I live in Grand Haven, formerly from Grand Rapids, and am retired – at least from employment, and am both a history and railroad buff. I made all of the maps for Meints’ book, and have been working on improving all of the lower Michigan county maps ever since, as well as a commentary, which I hope to publish some day. I’ve spent the last 5-6 years trying to locate logging railroads, at first only by maps, books, newspapers and aerial photographs, mostly on the internet. Three years ago a fellow member of the West Michigan Railroad Historical Society took me out metal detecting on obscure logging grades and I am now hooked on it. We go out looking for the old grades, often ones where I have limited knowledge of the exact location, and explore the areas until we find them and “track” down where they ran to and from. 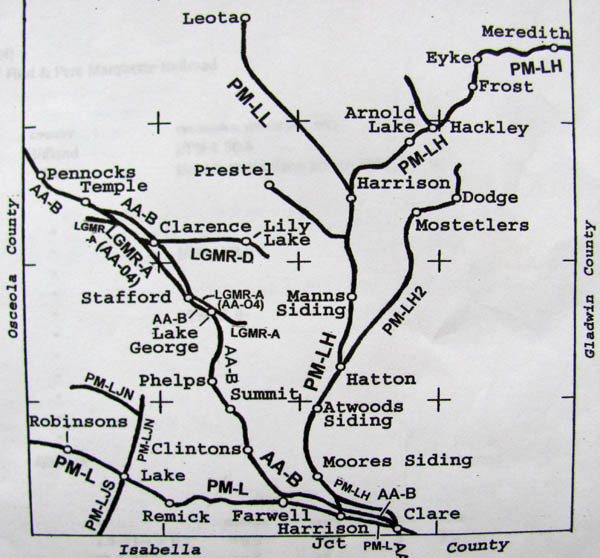 I noticed that in one old post you were asking for someone who knew more about finding logging railroad grades, which as we both know is sometimes easy but often very difficult. If you would like to ask any questions, I would be glad to help you out with either historical data or practical knowledge. Meanwhile, I applaud your efforts to keep local history alive. Often we talk to land owners who are totally unaware that an old logging line ran across their property until we share some of the history with them.